When looking at the Twitter page of an NFL draft prospect the term 'metallurgical engineer' is not one you expect to come across. 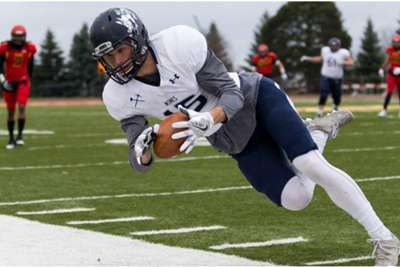 Metallurgy is the study of the physical and chemical behaviour of metallic elements, but how did a prospective NFL wide receiver end up with a degree in that field from the Colorado School of Mines – one of the top mining schools in the United States? It is a qualification that keeps Oliver's options open, which is fitting for a player whose willingness to try new roles has been pivotal to the progression of his football career. Like many 6ft 3in high school athletes, Oliver wanted to play quarterback. However, not highly recruited by prospective colleges, he resigned himself to that ambition not coming to pass. "I just wanted to keep playing football any way I could," he explained. "Originally when Mines recruited me they wanted me to play defense, they wanted to put me at corner or safety but then the guy who recruited me, he left, and the receivers coach asked me to move over to offense. To say that position switch paid off is an understatement. Oliver enjoyed a stellar collegiate career and led college football in receiving touchdowns in 2016 and 2018. Such achievements would normally lead to a lot of pre-draft attention, but Mines is not a powerhouse of collegiate athletics. It is a Division II program and, as a result, Oliver has flown largely under the radar. However, he was invited to the East-West Shrine Game and met with numerous scouts at that college All-Star contest, while the Los Angeles Chargers spoke to him after he produced a strong performance in athletic testing at his recent pro day. So @bsoliver15’s Pro Day went well..
Having played in college football's second tier, there are likely to be doubts over whether Oliver can make the substantial jump to the NFL. However, inspired by two small-school success stories in Minnesota Vikings star Adam Thielen and Los Angeles Rams wideout Cooper Kupp, Oliver has great confidence he can do so.